Some two years after Gov. Jerry Brown declared a state of emergency and enforced mandatory water restrictions, the severity of the drought in California still hasn’t quite sunk in for some. And why would it? All that people know is the faucet still turns on. Luckily for the odd water ostrich who’s stuck their head in the proverbial sand, there’s someone who has been watching and documenting this phenomenon—her name is Brittany App. 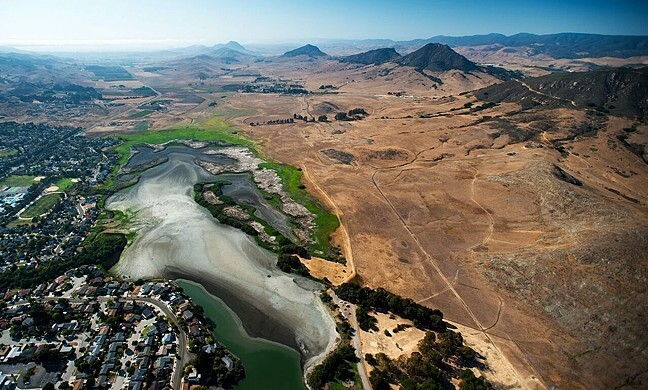 App, a local photographer and activist based in Atascadero, is currently filming a solutions-focused documentary called Where There Once Was Water that will shed some light on the progressing issue of water scarcity in California. CRACKS IN THE SYSTEM : Atascadero-based photographer Brittany App captures eye-opening images, like this one of Atascadero Lake, that show the state of our local lakes in their driest state. App’s inspiration for environmental do-gooding began in 2008 when she spent a semester at sea and was shocked by the harsh realities she discovered along the way. After this epiphany, App was inspired to make a change, so she rode her bicycle from San Diego to St. Augustine, Fla., to raise $15,000 for WaterAid, an international nonprofit that provides clean water and sanitation to communities in Africa and Asia. In 2014, App responded to the ALS ice bucket challenge with a different challenge to only use 5 gallons of water for one day. WHERE’D THE WATER GO? : Brittany App is creating a documentary, 'Where There Once Was Water,' about the ongoing California drought. As the drought began to intensify on the Central Coast, App decided it was time to turn her lens into a call to action. 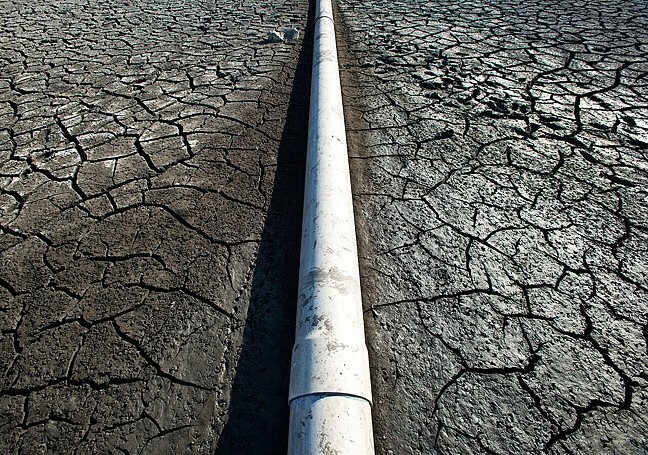 Soon after, App set out to work on a photography project to document the West Coast’s dwindling water supply. After a year and a half of in-depth research and photographing barren lands, she became overwhelmed with her findings. After six months of filming her first attempt at a feature-length documentary out of pocket, she knew she would have to crowd source to make her vision a reality. In February, she began an account on Kickstarter, an online funding platform. 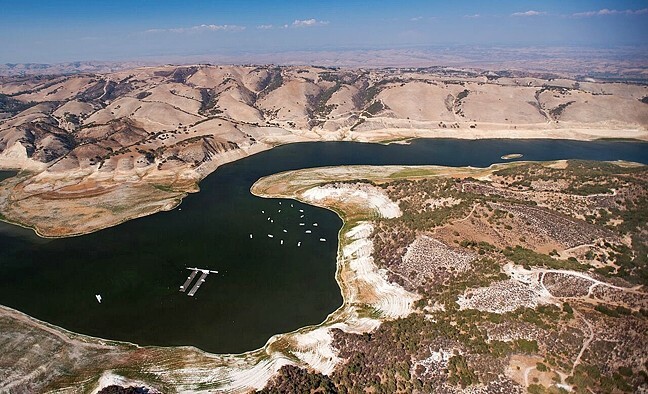 DESOLATE: Through this image of Lake San Antonio, local photographer Brittany App strives to create accurate and current photos to show the severity of California’s depleting water supply. App’s intentions stretch far beyond showing footage of dried-up lakes and climate change. She emphasized that the effects of food production are having a bigger impact on the water supply than many realize. Although App admits her response to how to reduce water consumption is an unpopular reality, she encourages that everyone should severely reduce or completely cut out daily meat consumption. App also wants to uncover the benefits of raising cattle sustainably by visiting and filming a farm called the Savory Institute, which uses ancient methods of raising cattle. According to App, much of the sustainability in beef production lies in the soil, which is what she intends to expand her knowledge of. App said that one of the most rewarding parts about making this documentary has been learning more through talking to a diverse range of experts on the subject. AVOIDING ROCK BOTTOM: 'Where There Once Was Water' will be released in 2018 into the film festival circuit and possibly online streaming services as well. Visit wherethereoncewaswater.com for more information. Where There Once Was Water will feature a series of interviews to better understand different angles of our water crisis and the solutions that must be put in place to begin making an impact. App will continue to film throughout April of 2017 and will be releasing it into the 2018 film festival circuit. New Times Editorial Intern Kat Schuster hasn’t washed her car in six months and people have started writing notes on her dusty hood. Send comments to Arts Editor Ryah Cooley at rcooley@newtimesslo.com.